This document provides an intuitive introduction and guide to the PROV specification for provenance on the Web. PROV is a core data model for provenance for building representations of the entities, people and processes involved in producing a piece of data or thing in the world. This primer explains the fundamental PROV concepts and provides examples of its use. The primer is intended as a starting point for those wishing to create or use PROV data. This document is part of a set of specifications aiming to define the various aspects that are necessary to achieve the vision of interoperable interchange of provenance information in heterogeneous environments such as the Web. This document is an intuitive introduction and guide with simple illustrative examples of the core aspects of PROV. The PROV family of specifications aims to define the various aspects that are necessary to achieve the vision of inter-operable interchange of provenance information in heterogeneous environments such as the Web. The specifications are as follows. PROV-SEM, a formal semantics for the PROV data model. The primer is the entry point to PROV offering a pedagogical presentation of the provenance model. The Linked Data and Semantic Web community should focus on PROV-O defining PROV classes and properties specified in an OWL-RL ontology. For further details, PROV-DM and PROV-DM-CONSTRAINTS specify the constraints applicable to the data model, and its interpretation. PROV-SEM provides a mathematical semantics. The XML community should focus on PROV-XML defining an XML schema for PROV-DM. Further details can also be found in PROV-DM, PROV-DM-CONSTRAINTS, and PROV-SEM. Developers seeking to retrieve or publish provenance should focus of PROV-AQ. Readers seeking to implement other PROV serializations should focus on PROV-DM and PROV-DM-CONSTRAINTS. PROV-O, PROV-N, PROV-XML offer examples of mapping to RDF, text, and XML, respectively. This primer document provides an accessible introduction to the PROV specification for provenance on the Web. The provenance of digital objects represents their origins. PROV is a proposed specification to express provenance records, which contain descriptions of the entities and activities involved in producing and delivering or otherwise influencing a given object. For the remainder of this document, we use the term 'provenance' to refer also to records of provenance, except where the distinction is important for clarity. By knowing the provenance of an object, we can perceive how to use it. 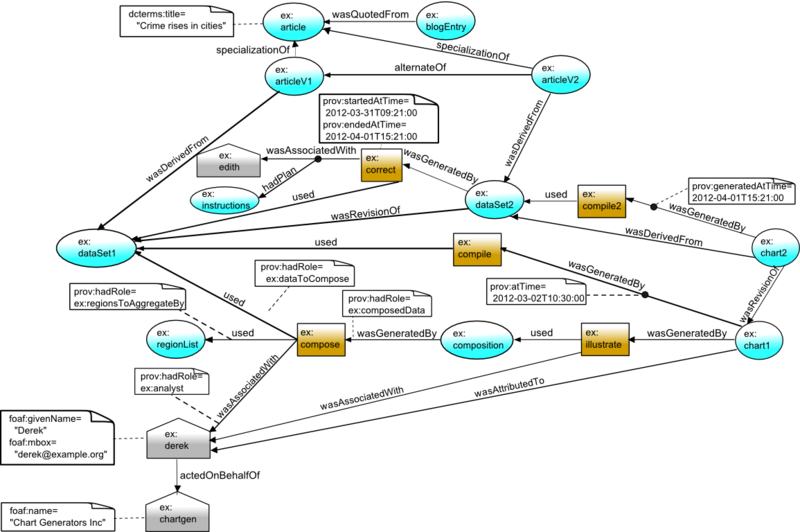 Provenance can be used for many purposes, such as understanding how data was collected so it can be meaningfully used, determining ownership and rights over an object, making judgments about information to determine whether to trust it, verifying that the process and steps used to obtain a result complies with given requirements, and reproducing how something was generated. As a specification for provenance, PROV accommodates all those different uses of provenance. Different people may have different perspectives on provenance, and as a result different types of information might be captured in provenance records. One perspective might focus on agent-centered provenance, that is, what entities were involved in generating or manipulating the information in question. For example, in the provenance of a picture in a news article we might capture the photographer who took it, the person that edited it, and the newspaper that published it. A second perspective might focus on object-centered provenance, by tracing the origins of portions of a document to other documents. An example is having a web page that was assembled from content from a news article, quotes of interviews with experts, and a chart that plots data from a government agency. A third perspective one might take is on process-centered provenance, capturing the actions and steps taken to generate the information in question. For example, a chart may have been generated by invoking a service to retrieve data from a database, then extracting certain statistics from the data using some statistics package, and finally processing these results with a graphing tool. Provenance records are metadata. There are other kinds of metadata that is not provenance. For example, the size of an image is metadata of that image but it is not provenance. For general background on provenance, a comprehensive overview of requirements, use cases, prior research, and proposed vocabularies for provenance are available from the Final Report of the W3C Provenance Incubator Group [ PROVENANCE-XG ]. That document contains three general scenarios that may help identify the provenance aspects of planned applications and help plan the design of a provenance system. An intuitive explanation of how PROV models provenance. A detailed description of all the concepts and relations in the PROV Data Model is provided in [ PROV-DM ]. A simple self-contained example that illustrates how to produce and use PROV assertions, highlighting how to combine PROV with other popular vocabularies such as FOAF and Dublin Core. A description of the formal PROV ontology (PROV-O) can be found in [ PROV-O ]. Example snippets using a notation of PROV designed for human consumption (PROV-N). Details of this notation can be found at [ PROV-N ]. There are additional reference documents for PROV that are not covered in this primer, including the PROV Access and Query aspects of the specification [ PROV-AQ ], the constraints on the PROV data model [ PROV-CONSTRAINTS ], a formal semantics of the PROV data model (PROV-SEM), and the PROV XML notation (PROV-XML). This section provides an intuitive explanation of the main concepts in PROV. As with the rest of this document, it should be treated as a starting point for understanding the model. The PROV data model document [ PROV-DM ] provides precise definitions and constraints [ PROV-CONSTRAINTS ] to be used. The following diagram provides a high level overview of the structure of PROV records, limited to some key PROV concepts discussed in this document. The diagram is the same that appears in the [ PROV-DM ] document. Note that because PROV is meant to describe how things were created or delivered, PROV relations are named so they can be used in assertions about the past. In PROV, physical, digital, conceptual, or other kinds of thing are called entities. Examples of such entities are a web page, a chart, and a spellchecker. Provenance records can describe the provenance of entities, and an entity’s provenance may refer to many other entities. For example, a document D is an entity whose provenance refers to other entities such as a chart inserted into D, and the dataset that was used to create that chart. Entities may be described as having different attributes and be described from different perspectives. For example, document D as stored in my file system, the second version of document D, and D as an evolving document, are three distinct entities for which we may describe provenance. Activities are how entities come into existence and how their attributes change to become new entities, often making use of previously existing entities to achieve this. They are dynamic aspects of the world, such as actions, processes, etc. For example, if the second version of document D was generated by a translation from the first version of the document in another language, then this translation is an activity. Activities generate new entities. For example, writing a document brings the document into existence, while revising the document brings a new version into existence. Activities also make use of entities. For example, revising a document to fix spelling mistakes uses the original version of the document as well as a list of corrections. Generation does not always occur at the end of an activity, and an activity may generate entities part-way through. Likewise, usage does not always occur at the beginning of an activity. An agent takes a role in an activity such that the agent can be assigned some degree of responsibility for the activity taking place. An agent can be a person, a piece of software, an inanimate object, an organization, or other entities that may be ascribed responsibility. When an agent has some responsibility for an activity, PROV says the agent was associated with the activity, where several agents may be associated with an activity and vice-versa. Consider a chart displaying some statistics regarding crime rates over time in a linear regression. To represent the provenance of that chart, we could state that the person who created the chart was an agent involved in its creation, and that the software used to create the chart was also an agent involved in that activity. An agent may be acting on behalf of others, e.g. an employee on behalf of their organization, and we can express such chains of responsibility in the provenance. We can also describe that an entity is attributed to an agent to express the agent's responsibility for that entity, possibly along with other agents. This description can be understood as a shorthand for saying that the agent was responsible for the activity which generated the entity. One may want to describe the provenance of an agent. For example, an organization responsible for the creation of a report may evolve over time as the report is written as some members leave and others join. To make provenance assertions about an agent in PROV , the agent must be declared explicitly both as an agent and as an entity. A role is a description of the function or the part that an entity played in an activity. Roles specify the relationship between an entity and an activity, i.e. how the activity used or generated the entity. Roles also specify how agents are involved in an activity, qualifying their participation in the activity or specifying for what aspect of it each agent was responsible. For example, an agent may play the role of "editor" in an activity that uses one entity in the role of "document to be edited" and another in the role of "addition to be made to the document", to generate a further entity in the role of "edited document". Roles are application specific, so PROV does not define any particular roles. When one entity's existence, content, characteristics and so on are at least partly due to another entity, then we say that the former was derived from the latter. For example, one document may contain material copied from another, and a chart was derived from the data that it illustrates. PROV allows some common, specialized kinds of derivation to be described. For example, a given entity, such as a document, may go through multiple revisions over time. Between revisions, one or more attributes of the entity may change. In PROV, the result of each revision is a new entity. PROV allows one to relate those entities by making a description that one was a revision of another. Another specialized kind of derivation is to say that one entity, commonly a document, quotes from another. Activities may follow pre-defined procedures, such as recipes, tutorials, instructions, or workflows. PROV refers to these, in general, as plans, and allows the description that a plan was followed, by agents, in executing an activity. Time is often a critical aspect of provenance. PROV allows the timing of significant events to be described, including when an entity was generated or used, or when an activity started and finished. For example, the model can be used to describe facts such as when a new version of a document was created (generation time), or when a document was edited (start and end of the editing activity). Entities are defined in a flexible way in PROV, allowing for different perspectives to be taken as appropriate for the application. The following are examples illustrating this idea. The same entity can appear with different descriptions in a provenance record because each appearance emphasizes different aspects of the entity, e.g. a book may be described by its title in one place and by its author and publication date in another. The same entity can evolve over time into different versions, e.g. a document that is repeatedly updated and has subsequent releases over time. The same entity can be copied or replicated, e.g. a document may be copied to several directories. An entity can go through different incarnations, e.g. a committee producing a report may have a set of members when the report is first released and have a different set of members when an update of the report is released. In all these situations, the more specific entities (the versions, copies, incarnations) can be said in PROV to be specializations of the more general entity (the book, the document or the committee as a general entity). The specific entities in each example are also alternates of each other, as they are specializations of the same general entity. Being aware that two entities are alternates allows those consuming the PROV data to know that understanding the provenance of one entity is salient to understanding the provenance of the other. Knowing that alternate entities are specializations of another allows a consumer of PROV to refer to the general entity with a unique identifier even though it is specified as different alternates throughout the provenance records. In the following sections, we show how PROV can be used to model provenance in a specific example scenario. Samples of PROV data are given. These samples use the namespace prefixes prov, denoting terms from the PROV ontology, and ex, denoting terms specific to the example. We illustrate in these examples how PROV can be used in combination with other languages, such as FOAF and Dublin Core (with namespace prefix foaf and dcterms respectively). The samples can be displayed in one or more of the following formats. [ PROV-O ] RDF triples, expressed using the [ TURTLE ] notation. Select the formats to display using the buttons below. Note that if all formats are hidden, the worked examples may not make sense! An online newspaper publishes an article with a chart about crime statistics making using of data (GovData) provided through a government portal. The article includes a chart based on the data, with data values composed (aggregated) by geographical regions. A blogger, Betty, looking at the article, spots what she thinks to be an error in the chart. Betty retrieves a record of the provenance of the article, describing how it was created. Betty finds the following descriptions of entities in the provenance. dcterms:title "Crime rises in cities" . These statements, in order, refer to the article (ex:article), an original data set (ex:dataSet1), a list of regions (ex:regionList), data aggregated by region (ex:composition), and a chart (ex:chart1), and state that each is an entity. Any entity may have attributes, such as the title of the article, expressed using dcterms:title above. PROV data is commonly visualized for human consumption using particular conventions, which we will introduce over the following sections. To start with, entities are denoted using ovals, as shown below. Further, the provenance describes that there was an activity (ex:compile) denoting the compilation of the chart from the data set. The provenance also includes reference to the more specific steps involved in this compilation, which are first composing the data by region (ex:compose) and then generating the chart graphic (ex:illustrate). In visualizations of the PROV data, activities are depicted as rectangles, as below. Concluding the basic description of what occurred, the provenance describes the key relations among the above entities and activities, i.e. the usage of an entity by an activity, or the generation of an entity by an activity. For example, the descriptions below state that the composition activity (ex:compose) used the original data set, that it used the list of regions, and that the composed data was generated by this activity. Similarly, the chart graphic creation activity (ex:illustrate) used the composed data, and the chart was generated by this activity. In visualizing the PROV data, usage and generation are connections between entities and activities. The arrows point from the future to the past. The record for Derek provides the following description that Derek is an agent, specifically a person, followed by non-PROV information giving attributes of Derek. Derek works as part of an organization, Chart Generators Inc, and so the provenance declares that he acts on their behalf. Note that the organization is itself an agent. foaf:name "Chart Generators Inc" . Finally, there is an explicit statement in the provenance that the chart was attributed to Derek. We can extend our graphical depiction to show the agents, association and attribution links. For Betty to understand where the error lies, she needs to have more detailed information on how entities have been used in and generated by activities. Betty has determined that ex:compose used entities ex:regionList and ex:dataSet1, but she does not know what function these entities played in the processing. Betty also knows that ex:derek was associated with the activities, but she does not know if Derek was the analyst responsible for determining how the data should be composed. The above information is described as roles in the provenance. 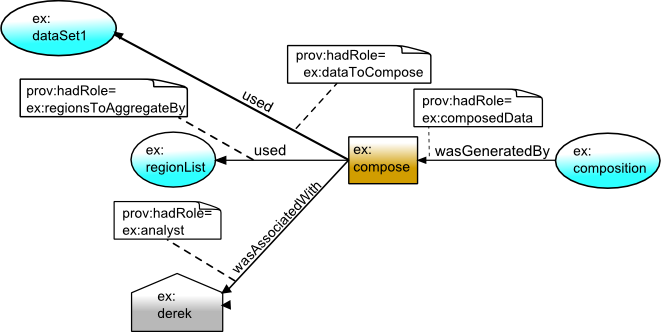 The composition activity involved entities in four roles: the data to be composed (ex:dataToCompose), the regions to aggregate by (ex:regionsToAggregateBy), the resulting composed data (ex:composedData), and the analyst doing the composition (ex:analyst). 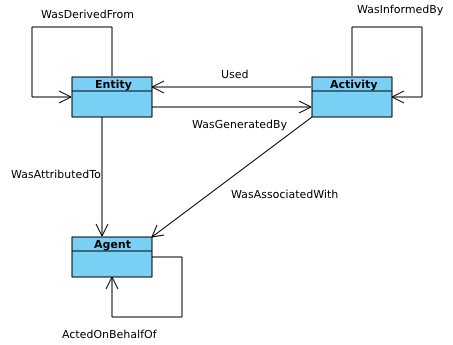 Examples in the sections above show descriptions of the simple facts that the composition activity used, generated and was enacted by entities/agents. For example, the usage of the data set by the compose activity is expressed as follows. The provenance can contain more details of exactly how these entities and agents were involved in the activity. To express this, PROV-O refers to qualified usage, qualified generation, etc., which are descriptions consisting of several statements about how usage, generation, etc. took place. For example, we may describe the plan followed by an agent in performing an activity, or the time at which an activity generated an entity, both illustrated later. Another example of qualified involvement is the role an entity played in an activity. The descriptions below state that the composition activity (ex:compose) included the usage of the government data set (ex:dataSet1) in the role of the data to be composed (ex:dataToCompose). In PROV-N, the role is expressed as one of the list of attributes in the used expression, with the attribute name prov:role. This can then be distinguished from the same activity's usage of the list of regions because the roles played are different. Depicting the above visually, we have the following. After looking at the detail of the compilation activity, there appears to be nothing wrong, so Betty concludes the error is in the government dataset. She looks at the dataset ex:dataSet1, and sees that it is missing data from one of the zipcodes in the area. She contacts the government agency, and a new version of GovData is created, declared to be the next revision of the data. The provenance of this new dataset, ex:dataSet2, states that it is a revision of the old data set, ex:dataSet1. Derek notices that there is a new dataset available and creates a new chart based on the revised data, using another compilation activity. Betty checks the article again at a later point, and wants to know if it is based on the old or new GovData. She sees a new description stating that the new chart is derived from the new dataset. Derivation and revision are connections between entities, and so depicted with arrows in our visualization. Betty then wishes to know whether the new data set correctly addresses the error that existed before. The provenance of the new dataset, ex:dataSet2, describes not only who performed the corrections, Edith, but also what instructions she followed in doing so (in PROV terms, the plan). First, the correction activity (ex:correct), the person who corrected it, Edith (ex:edith), and the correction instructions (ex:instructions) are described. ex:edith        a prov:Agent, prov:Person . The connection between them is expressed in PROV-O using a qualified association giving details of how Edith was associated with the correction activity, including that she followed the above correction instructions. In PROV-N, the plan is an optional parameter to wasAssociatedWith descriptions. Plans are additional information about the connection from an activity to an agent, and so, in our visualization, connect to the link between them. The government agency that produced GovData is concerned to know how long the incorrect chart was in circulation before the corrected chart was created. That is, they wish to compare the times at which the original and the corrected charts were generated. The snippet below shows that the second chart was generated roughly a month after the first. To ensure their procedures are efficient, the agency also wish to know how long the corrections took once the error was discovered. That is, they wish to know the start and end times of the correction activity (ex:correct). These details are expressed as follows, showing that the corrections took a little over a day. Time is visualized as additional information regarding activities or the links between activities and entities or agents. Before noticing anything wrong with the government data, Betty had already posted a blog entry about the article. The blog entry had its own published provenance, stating that it quoted some text from the article. The newspaper, from past experience, anticipated that there could be revisions to the article, and so created identifiers for both the article in general (ex:article) as a URI that got redirected to the first version of the article (ex:articleV1), allowing both to be referred to as entities in provenance data. In the provenance records, the newspaper describes the connection between the two: that the first version of the article is a specialization of the article in general. Later, after the data set is corrected and the new chart generated, a new version of the article is created, ex:articleV2, with its own URI where the article is redirected to. To ensure that those consulting the provenance of ex:articleV2 understand that it is connected with the provenance of ex:article and ex:articleV1, the newspaper describes how these entities are related. Note that above we could have also stated that ex:articleV2 was a revision of ex:articleV1, as we did between ex:chart2 and ex:chart1, which would describe more concretely how the alternate entities are related. Specialization and alternate relations connect entities, and so are visualized as links between them. We visualize the whole example below. Added selection between Turtle and PROV-N examples with supporting text. Removed reference to accounts, using bundles instead. Scaled the width of wide figures to aid printing. Used generatedAtTime rather than qualified PROV-O. Many clarifications and improvements throughout the text.